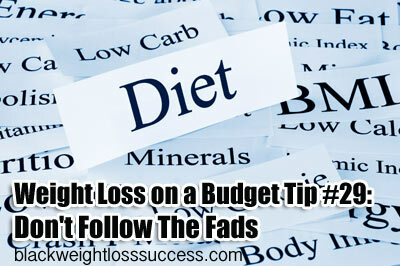 Today’s Weight Loss on a Budget Tip – #29: Don’t Follow The Fads! This tip is really easy to understand and follow. The bottom-line is that weight loss is an Industry! Any industry needs products, diverse products. If you’re in business, you also have to create new products to keep your marketshare and keep your customers interested. The way this works in the diet industry is that there are new fads, books and workout styles that become popular each year and those that die out. Sometimes the old diet and exercise fads will come back, and sometimes they are exposed as fads and abandoned by their followers. Buying into all of these plans and equipment can be very expensive, especially if you don’t lose weight with these plans. So, so how does knowing this save you money? Don’t spend money on fad diet products – You don’t have to buy the latest diet book, workout aid or pill to lose weight. You can change your eating and exercise and see results without special supplements or an online personal trainer. I’m not saying that there aren’t great books, workouts and programs out there for you to buy. There definitely are, but if you can’t afford them, avoid them. Get as Much Information as Possible on Diet Books Before You Buy – Read the reviews online on sites like Amazon. Research the science behind the diet books. Borrow the book from a public library or on Kindle and Nook’s borrowing system. Know what you are committing to and whether you truly believe it will work for you by doing your research. You’ll save money on books that aren’t good or good for you. Don’t Buy Equipment that You Don’t Need – I know that the infomercial on Saturday afternoon promised quick weight loss results, but you may not need it. You may really believe that you will use that elliptical machine if you buy it, but don’t if it’s just going to become a high priced clothes hanger. You have to be realistic and frugal because there will be a large variety of diet products to choose from. It’s easy to spend a lot of money on trial and error. Focus on affordable items like an ab wheel, free weights, yoga mat, lifting gloves, weight bench and workout DVDs.